Today I discovered a (life changing for me!) 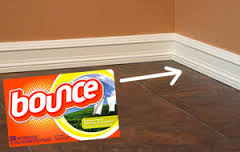 baseboard cleaning tool that I am excited to share- dryer sheets. With two dogs in my house, I have to clean my baseboards frequently and loathe doing it. Getting on my knees with a bucket, cleaners, and rags... Not fun. I have read in the past about dusting with dryer sheets and decided to try it on my baseboards. It was amazing! It was so easy to clean with and a bonus is that it coats as it cleans for residual dust-fighting power. When used on your baseboards it can not only help repel pet hair, but will generally keep the things that get tracked in and out of our home off the walls and on the floor where it can be swept up. It can turn the weekly (or monthly) task into something that is done every few months or even a few times a year. Older PostSingle Story home in Stonebriar with 3 car garage and possible RV parking!